The process to implement the Patent Watching/Monitoring service at regular time periods has become the key to assure safety to your patents. It can be monitored from official journals, databases, online sites, etc. to search for newly published, granted, or pending patent applications within the boundaries of requirements specified at the beginning of the watch. There are many reasons due to which corporates implement patent watching search, such as to check competitors in the market, double check if their service or products are being infringed, etc. Overall, the main aim is to bring awareness about the market strategy, competitor’s potential resources, and to determine the strength in our services or products. By maximizing the effectiveness of your inventions’ legal protection with the patent and utility model watch, infringements of your rights are reduced. Constant monitoring could ensure the monopoly on inventions. By identifying these potential infringement problems related to the exclusive manufacture, sale, or importation faculties in each jurisdiction, the cost of solving industrial property issues with more complex procedures will be minimized. Learning about the technological sectors in which competitors are focusing on research and responding is an important essential for companies that have made innovation, the strategic leverage of their business. 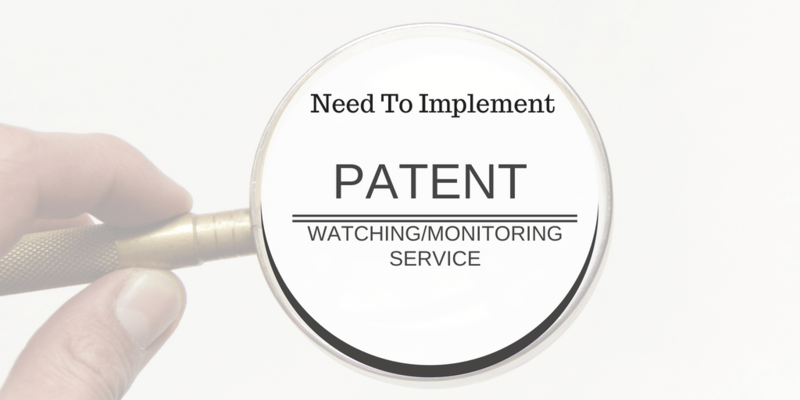 Why implement Patent Watching/Monitoring service? Anyone holding responsibility of bearing a patent securely by ensuring its value and protection of its total assets can implement patent watching service. It can be an inventor, patent owner, business, or any industry. The spread of patent watching service will vary according to the inventor’s requirements and need inside the patent application. We at, The Patent Search Firm, is an exclusive team of skilled professionals who hold min. Five years’ experience in the patent field. We are serving our clients from 42+ nations, for the past eight years of our foundation, covering 30+ technical areas and getting 500+ monitoring tasks every single month. Our company is well known for delivering quality products on time. The patent watching/monitoring is conducted through a latest-generation technological system, which analyses the patents and utility models filed in any jurisdiction. First Inventor to File: What & How to Deal With This Patent System? This entry was posted in Blog and tagged Freedom to Operate Search, industrial property, innovation, Invalidity Search, inventor, legal protection, patent applications, patent owner, patent watching service, prior art searching. Bookmark the permalink.